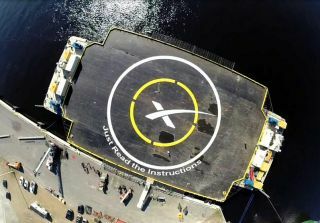 SpaceX will attempt to land a Falcon 9 rocket on it drone ship Just Read The Instructions on Feb. 8, 2015 as part of a reusable rocket technology test. The drone ship is named after the sentient colony ship in the science fiction novels by author Iain M. Banks. When SpaceX launches a long-delayed satellite to study space weather on Sunday, the private spaceflight company also hopes to do the amazing: return a rocket to Earth and land it on a floating platform in the Atlantic Ocean. SpaceX will attempt to land the first stage of its 14-story Falcon 9 rocket after launching the Deep Space Climate Observatory (DSCOVR for short) from Cape Canaveral Air Force Base in Florida. Liftoff is set for Sunday, Feb. 8, at 6:10 p.m. EST (2310 GMT) and will be webcast live by NASA TV. "Rocket made it to drone spaceport ship, but landed hard," Musk wrote on Twitter after last month's attempt. "Close, but no cigar this time." Now, SpaceX is ready to try it again. This time, SpaceX has loaded 50 percent more hydraulic fluid on the Falcon 9 booster, so there should be plenty of margin during the rocket's descent back to Earth. "At least it should explode for a different reason," Musk wrote last month. Musk and SpaceX have been pursuing reusable rockets because the technology has the potential to dramatically lower the costs for both satellite launches and human spaceflight. The company is also building a new giant rocket, called the Falcon Heavy, and unveiled a video showing the mega-rocket's reusability last month. Engineers conduct solar array tests on the Deep Space Climate Observatory satellite ahead of its Feb. 8, 2015 launch on a SpaceX Falcon 9 rocket. SpaceX's Falcon 9 rockets are named after the fictional Millennium Falcon starship from "Star Wars." Continuing that theme, Musk has named SpaceX's drone ship "Just Read the Instructions" after the sentient colony ship from the science fiction novels by author Iain M. Banks. The drone ship will be positioned about 370 miles (595 kilometers) off the coast of Florida to await the Falcon 9 booster's landing attempt, said Hans Koenigsmann, SpaceX's vice president of mission assurance, in a prelaunch briefing on Saturday. "We hope it will go well this time," Koenigsmann said of the landing try. "However, I really want to point out that this is a secondary objective." The mission's primary goal, Koenigsmann stressed, is the successful launch of the DSCOVR space weather satellite. The Sunday liftoff will mark a second chance of sorts for the spacecraft. The DSCOVR satellite mission has had a long road to space, one which began during the Clinton Administration when then-Vice President Al Gore advocated the mission to provide live images of Earth from space 24 hours a day. The mission, initially called Triana, was approved in 1998, but eventually shelved as costs rose. NASA and National Oceanic and Atmospheric Administration (NOAA) revived the DSCOVR mission in 2009, this time to monitor space weather and solar wind while also studying the Earth. Altogether, the Triana and DSCOVR projects have cost about $340 million, mission managers said. That total cost includes the estimated $104.8 million for the entire mission life of DSCOVR. The refridgerator-sized DSCOVR will be sent to the sun-Earth Lagrange point 1, a location about 930,000 miles (1.5 million kilometers) from Earth that is directly between Earth and the sun. The Deep Space Climate Observatory launching on Feb. 8, 2015 will be placed at Lagrange 1, a point of gravitational stability between the Earth and sun. There, the satellite will monitor space weather events and capture detailed imagery of the entire Earth. "DSCOVR will succeed NASA's Advanced Composition Explorer's (ACE) role in supporting solar wind alerts and warnings from the L1 orbit, the neutral gravity point between the Earth and sun approximately one million miles from Earth," NOAA officials wrote in a mission description. "L1 is a good position from which to monitor the sun, because the constant stream of particles from the sun (the solar wind) reaches L1 about an hour before reaching Earth." When aimed at Earth, the largest solar storms can pose a danger to astronauts and satellites in space, and interfere with GPS navigation systems, aviation operations and power grids on the surface, NOAA officials said. "The impacts from space weather are very wide-ranging, with potentially severe consequences," Tom Berger, the director of NOAA's Space Weather Prediction Center in Boulder, Colorado, told reporters Saturday. "DSCOVR will serve as our tsunami buoy in deep space." DSCOVR carries five separate instruments, three of which will track solar wind and space weather events. The other two will monitor the Earth. One of those is the Earth Polychromatic Imaging Camera, or EPIC, which will take images of the sunlit side of Earth every 2 hours for 24 hours a day. A day after being taken, the images will be available for scientists and the public through NASA's Langley Research Center in Hampton, Virginia, mission managers said. Editor's note: This story was updated at 2 p.m. EST to include new details about the DSCOVR mission and the SpaceX landing attempt. Visit Space.com on Sunday beginning at 3:30 p.m. EST (2030 GMT) to watch the launch live.